I just wanted to take a quick moment to express my pleasure in the plans and framing kit I recently purchased for the TNT. I found the instructions and plans to be complete and easy to follow, but I must admit I wondered what I had gotten myself into with this being my first attempt at building a boat. I worked on it in the evenings and some weekends and completed it in under two months, which was much faster than I had figured it would take. I was also concerned that what I built would be too boxy or not flowing; but with the framing and fastening kits you provide, the lines come naturally. 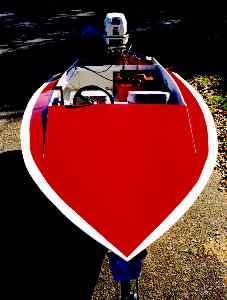 I've enclosed some pictures of my completed TNT and I must admit it turns some heads down at the lake! I currently am running a 25 hp with a 10 x 17 prop and she moves and handles great. Anyway, hats off to you all for a great product, I hope to build another one real soon!